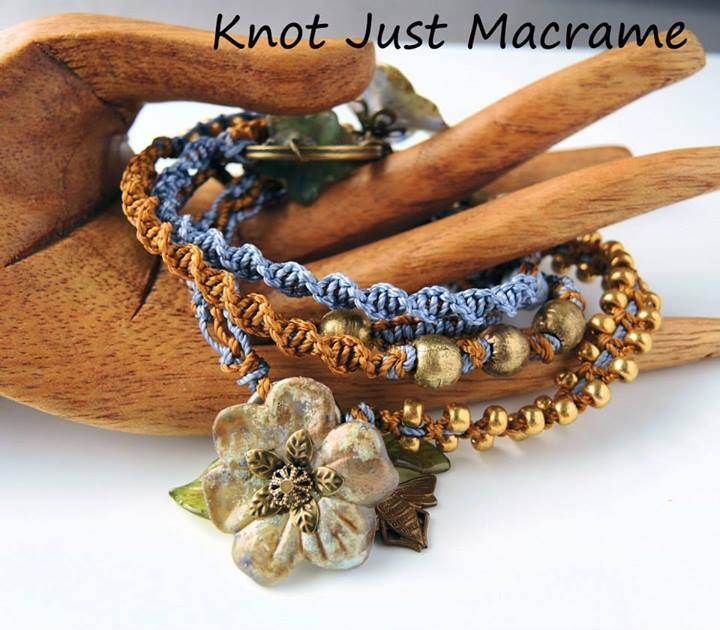 Knot Just Macrame by Sherri Stokey: Micro Macrame eClasses Are Available! Micro Macrame eClasses Are Available! I can finally make my BIG announcement! I'm the newest instructor at CraftArtEdu.com and I have classes available in micro macrame!!! YAY! You might have noticed that I'm crazy about micro macrame and I am thrilled to get this chance to share it with you. I have two classes available right now (and another ready for my editor). The first is Micro Macrame 101 and it is free (yep, free!). 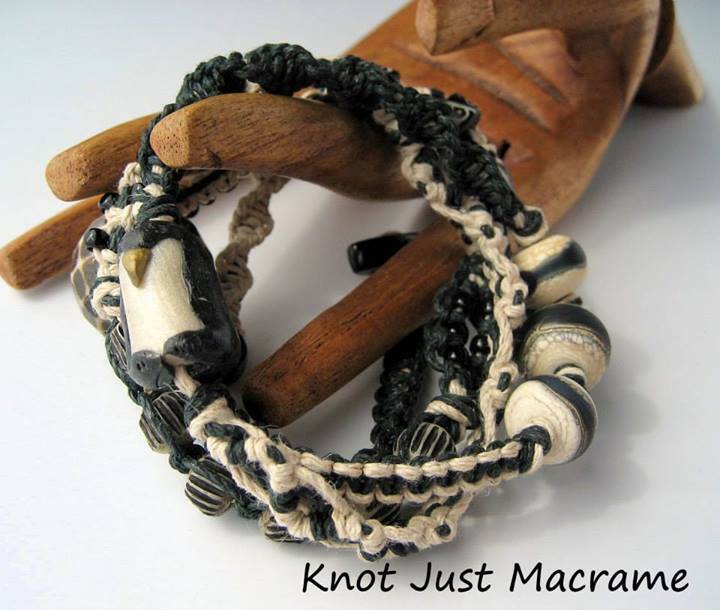 It's an overview of the tools and materials you'll need to try micro macrame for yourself. I included information from cord choices to knotting surfaces. One of the nicest things about micro macrame is that you don't have to invest a lot of money in tools and equipment to give it a try. Micro Macrame Wrap Bracelet is the other class available and covers the five of the most common macrame knots. 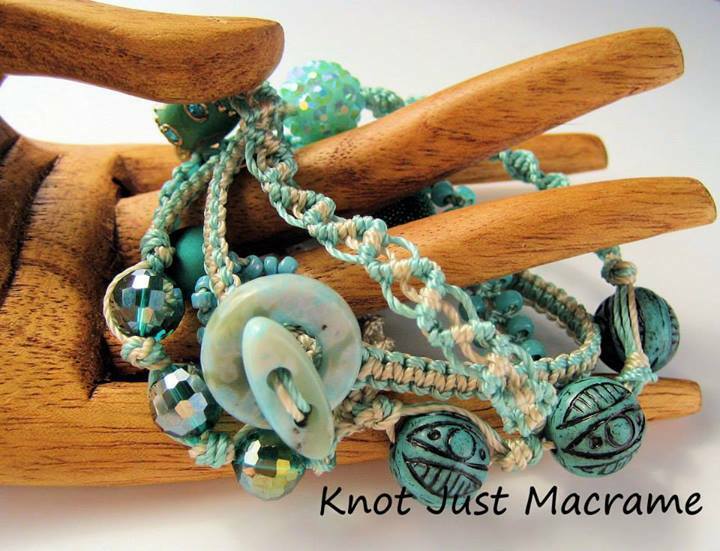 But just learning knots would be boring and I try never to be boring, so while you're learning to tie the knots, you'll be making a fun wrap bracelet like the ones shown in this post. 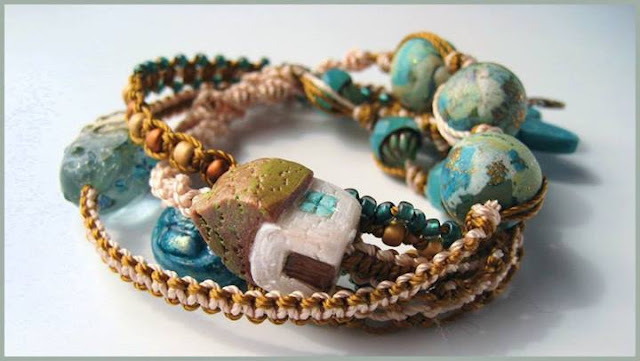 I'll show you step-by-step how to take a a couple lengths of cord and a small pile of beads and turn them into your own fun, wearable bracelet. This project is doable, even for people with no knotting experience at all. AND it's a great way to show off some of the beads you've been hoarding! The one above features a polymer clay penguin by Lennis Carrier of Windbent. The one below has a beachy theme and has polymer pieces by Lennis Carrier, Marlene Cupo and Ke Robinson, as well as a ceramic toggle by Shelley Graham and lampwork by Mitosis Glass. I was playing around with different variations when testing my tutorial. I used hemp cord instead of nylon in the penguin piece and did a mixture of both cords in the brown and black rose piece. In this last one, I experimented with tying a couple rings into the knots of the bracelet (you can just add them in with an overhand knot). Then I went back and attached some hand-painted lucite flowers and leaves to the rings as well as a little Vintaj bumblebee. I think this would be a really fun way to show off some charms - an updated take on a charm bracelet! Oh, and if you want to learn to do the flowers, the tutorial is here. I hope you'll take a minute to check out CraftArtEdu.com. I have been really impressed with the site. They have loads of great classes available and some really, really talented instructors. And the nice part (well, besides being able to get instruction at any hour of the day or night even if you're in your jammies...) is that once you purchase a class, it never expires. It's always available for you to reference. Nice, huh? The next best thing to having me come to your house and teach you micro macrame. Better really - you don't have to feed me! WOW!! THANK YOU so much!!! I have been looking at your tutorials on Etsy and felt intimidated, so I am sure this will give me some confidence to attempt one now!! I love your work!! Yep, THIS is where you want to start. This will show you the knots and THEN you'll have the confidence and knowledge to do the others! Oh I have to dart over and pick up the free course now and the other one when I have some extra cash. Thank you Sherri! I recently found your blog. Your work is gorgeous! I'm just starting back after several years. Good luck to you! I love macramé, as a teacher I made lots of frienship bracelets with the kits, but what i see here is so much more and taken macrame to the nezt level! I am now a follower!! Thanks for the inspiration. I've tried some basic macrame bracelets but none as beautiful as you have made. I would love to try this---it looks like so much fun! Thanks for the chance to win.